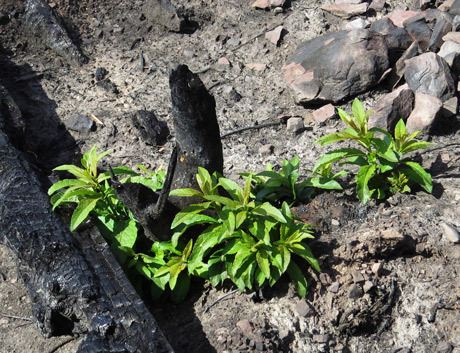 Vegetation began re-sprouting before the smoke cleared in 2015! Hundreds of scientists are in agreement that burned trees are essential to ecosystem resiliency and that logging does more harm than good to areas burned by forest fires. Include "Trail Creek Fire Salvage Project in the subject line! Download here as a pdf, print, sign, and post the sample letter to Matt Shaffer, 650 Wolfpack Way, Kalispell, MT 59901. 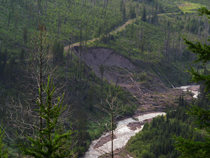 The Trail Creek Fire Salvage Project can be viewed and downloaded here. ". . . numerous scientific studies tell us that even in the patches where forest fires burn most intensely, the resulting wildlife habitats are among the most ecologically diverse on western forestlands and are essential to support the full richness of forest biodiversity . . . This post-fire renewal, known as 'snag forest' is quite simply some of the best wildlife habitat in forests, and is an essential state of natural processes . . . post-fire logging does far more harm than good to public forests." You should focus instead on problems being caused by your logging roads and the noxious weeds along them. You’ve already been awarded Burned Area Emergency Restoration (BAER) money to spray 88 acres of weeds along existing roads, so you don’t need to sell logs to pay for it. The last thing you should do is put logging and road building machinery in there, spreading those existing weeds across the landscape! Because you did the right thing in the late 1990s and decommissioned 20 miles of roads in the area to protect grizzly bear security and fisheries by removing their culverts, you only have a few culverts causing problems for fish and water quality on the remaining roads. But you now propose to rebuild 7 miles of those previously decommissioned and re-vegetated roads so you can log in Grizzly Bear Security Core and then have to deconstruct these roads again to re-secure bear and fish habitat! This is an unacceptable disruption of Security Core, a senseless waste of taxpayer dollars, and would cause repetitive reconstruction/deconstruction releases of sediment from roads that were previously “waterproofed” and simply need to be left alone. That leaves the planting of elk forage and trees as the only “restoration” work you say you need money for. Yet your BAER reports, your proposal and news articles say that vegetation began sprouting immediately after the fire. All you really need to do is keep logging and road rebuilding machinery off this area so that natural regeneration doesn’t get trampled and can continue to green up as it has following fires for millennia! You have already sold three roadside fire-related timber sales in the area since the 2015 fires and you reworked the pre-fire Cedar Chipmunk Timber Sale so it is now logging fire-killed trees - all with no public involvement. Now you want to rule out formal public Objections to your Trail Creek Fire Salvage Project by seeking an “Emergency Situation Determination.” Don’t do it! Moreover, you already have numerous “green” timber sales units authorized near the Trail Creek Fire area. Don’t waste your time and taxpayer money writing an Environmental Assessment or Environmental Impact Statement that tries to rationalize the need to violate Forest Plan Grizzly Bear Security Core standards for several years with the Trail Creek post-fire logging proposal. Instead, remove or clean the several culverts you are having trouble with, leave the culvert-less decommissioned roads alone, and let the area continue recovering as nature intended.